Both of these mice, the ROCCAT Kone XTD and the Kone Pure, feature half a megabyte of on-board memory along with a dedicated 32-bit processor. It's kind of crazy when you think about it, given that these are mice, but the key to unlocking them really is in ROCCAT's software. Unfortunately, that software does have a slight learning curve. The common problem of having a lot of features is that it can be overwhelming, and peripheral designers have almost never gotten the software right. 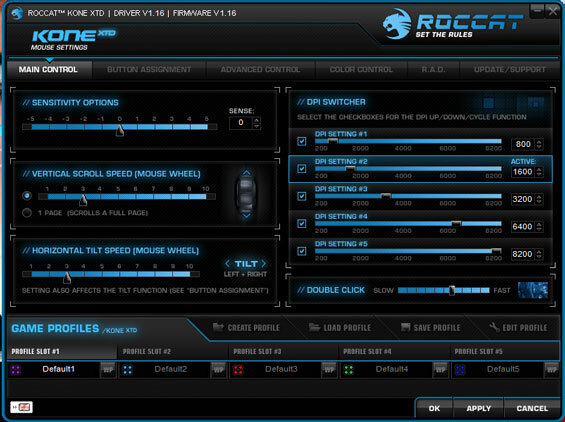 Frustratingly, ROCCAT doesn't have a unified software package for all of its peripherals. That means you'll need to download and install different drivers for different peripherals. This is kind of silly when you realize just how much is duplicated between the suites; the XTD's software suite was only slightly different from the Pure's. Note that both mice can store up to five different profiles, and these profiles are extremely detailed. The first page of the Kone software contains extremely detailed control for all of the mouse motion and allows for up to five dpi settings per profile. It's self-explanatory, but it's still very busy, and I've honestly never had a great need for this much detail. Your mileage may vary, though. In my opinion, the Button Assignment page is practically the Kone's ace in the hole. These "shift" functions are becoming increasingly common, and the Kone adds a little to its learning curve by configuring the typical "back" button to be a shift button. Hold the shift, and the "Easy-Shift" profile is available. 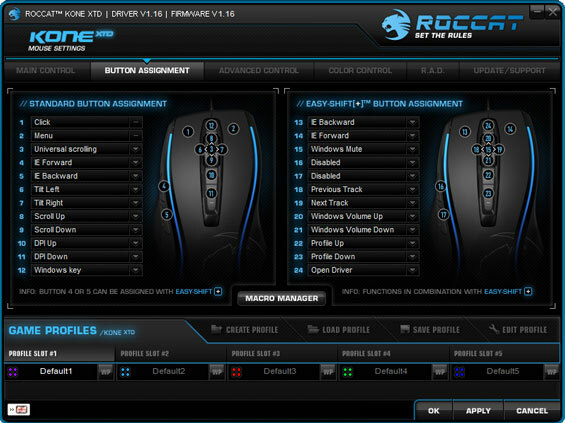 I love that ROCCAT treats virtually every function of the mouse like a button, though. Just about every function you could want can be configured, though, including media keys, DPI shift for aiming, and macros. If anything I wish they'd found a way to include another button to use as the "Easy-Shift," one that doesn't basically replace the back button. The remaining pages include even more detailed and precise pointer control functionality, color configuration, and ROCCAT even has a mouse-related achievement system. This last one could probably be done without in favor of simplifying the software some. It's not in the way, necessarily, but it's kind of silly. You can also use the software to update the firmware of the mice, and configure the software's voice. Whenever you switch profiles, a gravelly voice says "Profile Up" or "Profile Down." He thunders and is actually a little off-putting, but you can turn disable him. "...and I look forward to getting more of their hardware in for testing." I suppose Capsule Review means not a full Anandtech review? surface compatibility - wood, glass, laminates, black glossy surface, black matte, etc. Also state surface used for the benchmarks/tests. -reproducibility in X, Y and both axis - e.g. set the OS mouse config to no acceleration then repeatedly move the mouse physically from point A to B and back to A again, how far is the mouse pointer on screen. repeat test at higher speeds and higher iterations. -does 5 cm horizontally move the mouse pointer the same distance as 5 cm vertically? Do physical circles end up being circles on screen or ovals or worse? -maximum lift height before motion stops being detected. -max/average lift/place jitter (how much the mouse pointer moves when lifting the mouse straight up and then placing it straight down - can test by locking the mouse down and moving the surface instead). i use the g9x though, sensor is bad, built in mouseaccel, and it doesn't track that smoothly. however, the grip on the g9x is too good. (I don't use the shell) and for my 28cm/360 it's not bad. G400 does not have the wheel tilt, nor the braided USB cable. Some of us to find those to be deal breakers vs the G500. I'm currently holding onto my G9 (not G9x). Found it to be the best among the many I've tried (G400, G500, G600, G700, Naga, Naga Epic).